Hey bloggers! This is my project for the current House Mouse and Friends Monday Challenge (HMFMC) #158 My Favorite Things. The card SCREAMS my favorite things... all things autumn... rhinestones... and House Mouse Stamps! How much better than that can it get, I ask you? This is Turning Over a New Leaf and shouldn't EVERY day be like that?!? ;) I've colored the image with Copic markers. Printed card stock is from StoryTellers. Oops! That's another favorite! I love their printed card stock! Ribbon, plain card stock and rhinestones are from my stash. The sentiment itself is the way I love to approach life as well. Each day might bring on a little trouble or burden but so long as you remember what brings a smile to your face and peace in your heart, it's all good! I hope to see you over at HMFMC for their current challenge. We'd love to see what all are YOUR favorite things! Ema, This is just darling. I love the colors and the way your dotted around your image. Great job on this one. Wonderful card Ema, I so love this image and your colours of autumn. This is a gorgeous card Emma, such wonderful rich colours. 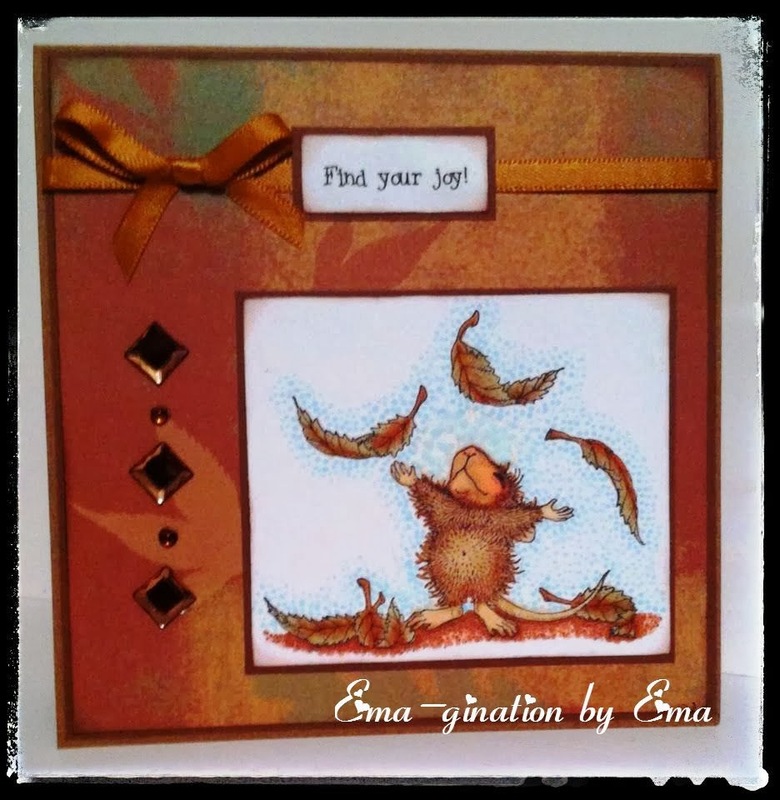 A gorgeous card Ema, such a sweet image and fabulous colours and details!! So happy to have you join the House Mouse family!!! Hi Ema awesome creation for the chall theme stunning warm autumnal colours clever take on the chall theme. Thanks for sharing your lovely Guest design creation with us at House Mouse & Friends chall..